Baltimore Brew’s reporting on Kevin Plank’s Port Covington project was recognized by the Maryland-Delaware-D.C. Press Association (MDDC) at a ceremony in Annapolis yesterday, garnering a “Best of Show” award in a field that included the Washington Post, Baltimore Sun and other publications. “Uplifting a Struggling City or Deepening the Race-Class Divide? Massive Subsidy for Plank’s Waterfront Development Stirs Debate in Baltimore” was one of several entries by The Brew to win first-place awards. The package of Port Covington stories, by staff writers Mark Reutter and Fern Shen, included detailed analyses of the city’s $660 million (TIF) tax increment financing package for the waterfront development and a close look at the project’s potential impact on housing, poverty and racial segregation in Baltimore. It’s coverage that The Brew is continuing: Last week we broke the story that private capital is lagging for Port Covington. Pushed through with great urgency last year by city leaders, the project is now at least nine months behind schedule. The contest had 38 other entries – from large and small-circulation newspapers, as well as online publications – in the “Growth and Land Use Reporting” category. In all, the MDDC 2016 Editorial Contest had 2,100 entries in 51 categories, according to MDDC executive director Rebecca Snyder. 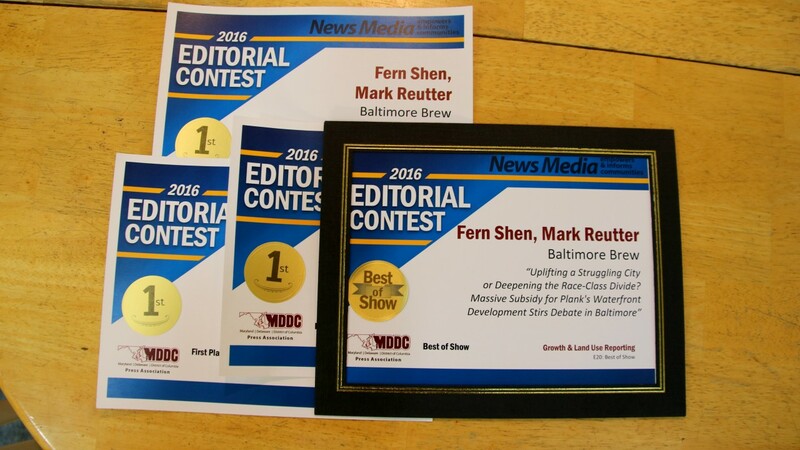 In MDDC’s new “Online Only” division, Shen’s reporting on the Baltimore Liquor Board took first-place honors in the “Local Government” category. Shen’s coverage of the trash-burning power plant proposed near Curtis Bay won first place division honors in the “Environmental Reporting” category. 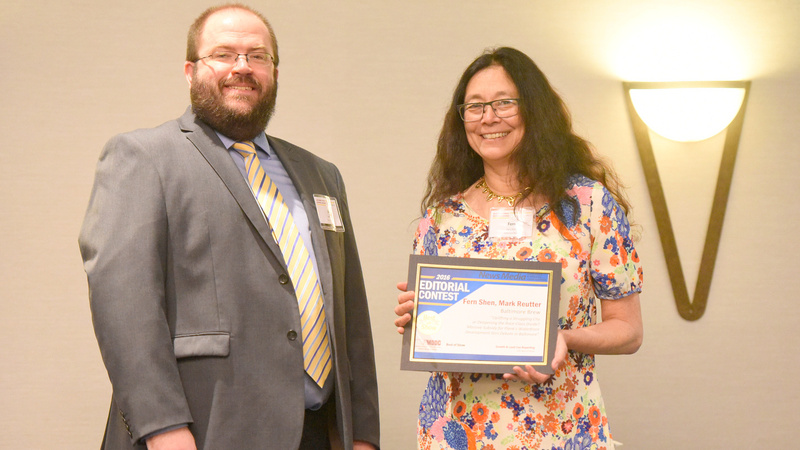 She accepted the award for the website’s Port Covington coverage from MDDC board chair Jake Womer, executive editor of The Herald Mail, at a luncheon ceremony in Annapolis. “It was really great to win a ‘Best of Show’ – especially in our first time entering this competition,” Shen, The Brew’s editor and publisher, said afterwards. The six-year-old independent news organization, which is supported by readers and foundations, focuses on accountability and community reporting about Baltimore. For The Brew, attending the event along with more than 200 other reporters, photographers, editors and publishers was a welcome opportunity to step away from the daily news cycle and applaud the good work of our media colleagues from across the region. Education reporting by the Baltimore Sun’s Erica L. Green and continuing reporting by multiple staffers on “The Death of Korryn Gaines” were among the top honors for the city’s newspaper-of-record. At the Baltimore City Paper table, top honors accumulated for a number of categories – including a “Best of Show” for the alternative weekly’s editorial “344” that listed the details of all 344 homicides in Baltimore in 2015. Among the awards for the Baltimore Business Journal was its “One Year Later” special section, looking at the aftermath of the unrest following death of Freddie Gray. Lots of fine work to celebrate. And it’s good to know, in these days of search-engine-optimization, that headline-writing is an art still celebrated. “Police: Sheep nabbed after night on the lam,” won top honors for The Frederick News-Post and big cheers from the room.